Set of two 200ml products from Olieve. The hand and body wash will leave your skin soft and silky, while the head-to-toe moisturiser provides you with the essential antioxidants and vitamins needed to nourish and protect your skin. 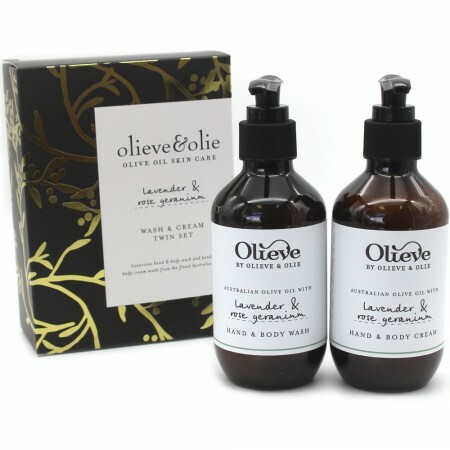 Australian grown olive oil base, with lavender and rose geranium. Calming lavender and rose geranium scent. Hand and body wash (200ml): Olive oil soap, coconut oil soap, castor oil soap, sodium borate, (palm oil free) glycerine, lavender oil, rose geranium oil. Hand and body cream (200ml): Purified water, olive oil, grapeseed oil, avocado oil, beeswax, cacao seed butter, wheat germ oil, potassium olivoyl hydrolyzed wheat protein, rosemary leaf extract, sodium borate, parfum, lavender oil, rose geranium oil, orange peel oil.